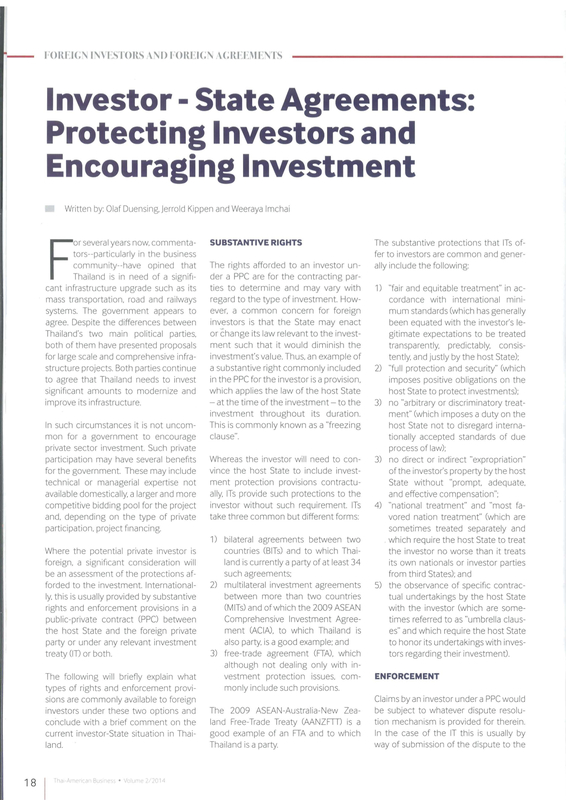 3) free-trade agreement (FTA), which although not dealing only with investment protection issues, commonly include such provisions. 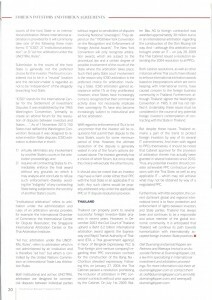 The 2009 ASEAN-Australia-New Zealand Free-Trade Treaty (AANZFTT) to which Thailand is also a party is a good example of and FTA and to which Thailand is a party. This entry was posted in Uncategorized on October 19, 2015 by duensingkippen. 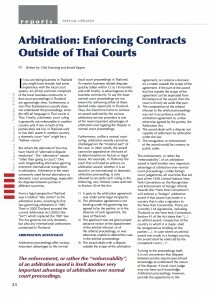 The Thai Arbitration Institute (TAI) — currently under the auspices of the Thai government’s judiciary — is the most commonly chosen institutional arbitration service provider by commercial parties to administer their contractual dispute arbitrations seated in Thailand. Unless the parties agree to deviate from the TAI Rules — and somewhat controversially — “with the consent of the Director of the Alternative Dispute Resolution Office”, the TAI Rules will apply to any arbitration proceeding under its administration. Part 2 of this article covers the Costs of the arbitration and the arbitrator’s Fee — and who pays them — in a TAI arbitration. 12. Other expenses relating to arbitral proceedings for example, transportation, accommodation, etc. This entry was posted in Uncategorized on January 6, 2015 by duensingkippen. 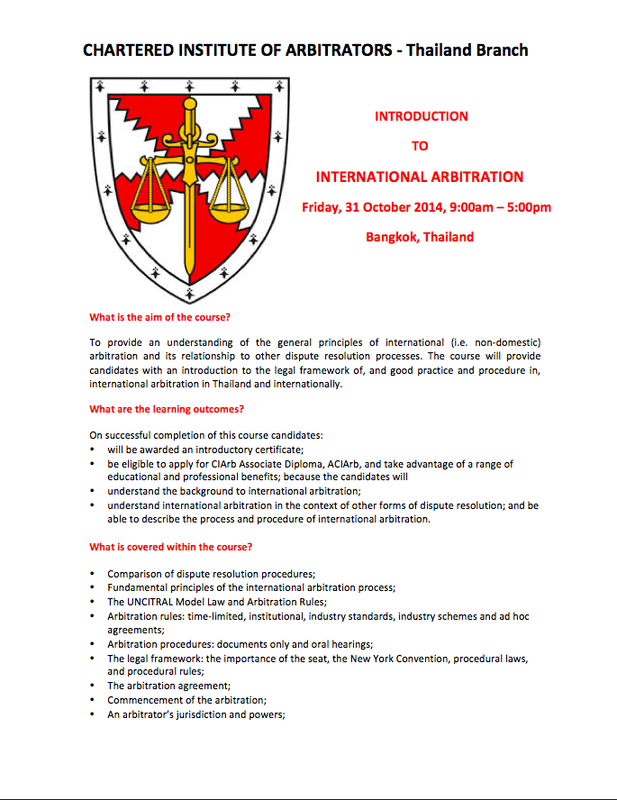 INTERNATIONAL COMMERCIAL ARBITRATION TRAINING AND CERTIFICATION IS COMING TO THAILAND FOR THE FIRST TIME IN EIGHT YEARS. “Investor – State Agreements: Protecting Investors and Encouraging Investment”, in the American Chamber of Commerce’s May-June 2014 Thai-American Business magazine; our latest published article on international commercial arbitration. This entry was posted in Uncategorized on June 7, 2014 by duensingkippen. In part one of this blog we introduced you to formal arbitration. We told you that formal arbitration is way for you to resolve your dispute with your contract partner without having to take them to court. Further we told you that the former has many advantages over the latter. One reason for that is the worldwide recognition and enforceability of your arbitration agreement and award—as we explained in part one and part two of this blog. In this part of our blog we will tell you some of the other reasons why you should strongly consider using arbitration to resolve any intractable disputes with your contract partner and slightly about how you should do so. It is not uncommon that disputes between parties require specialized knowledge to understand the nature of the dispute. A local court judge may not have such knowledge. Arbitration proceedings, however, provide you with the opportunity to have the dispute settled by a specialist who understands the issues surrounding your claim from a practical point of view. 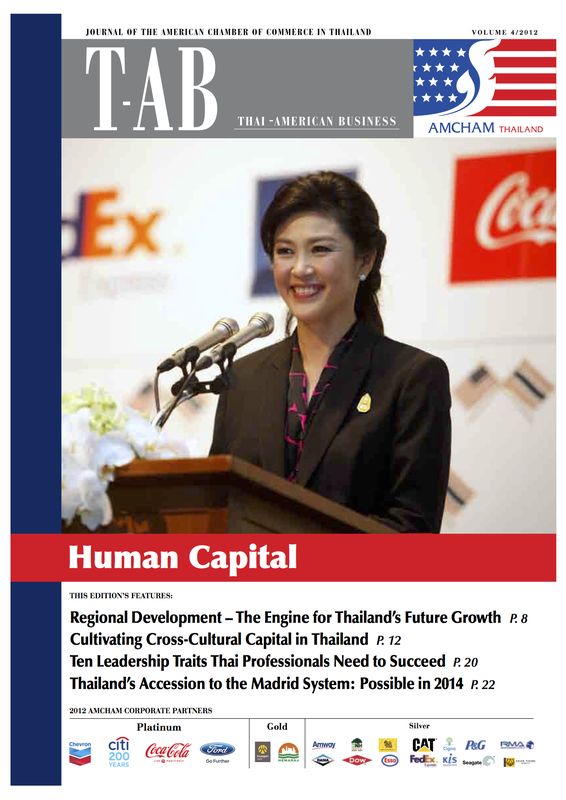 This enhanced adjudicatory flexibility is reflected in, for example, Thailand’s Arbitration Act, which defines a qualified arbitrator as one who is “(…) impartial, independent and possess the qualifications prescribed in the arbitration agreement (…)”. Furthermore, in an arbitration proceeding you are not only able to select a qualified arbitrator, but you also have the right to choose the place and the language of the arbitration proceedings. 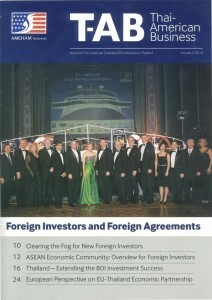 If you are doing business in a foreign country, to be able to: (i) select a convenient venue for the proceedings; (ii) understand the proceedings without the necessity of a translator; and (iii) submit all documentation without having to translate them into a foreign language—are all major advantages to settling disputes by arbitration. Another procedural advantage of arbitration over normal court proceedings relates to “Service of Process” or how you formally notify your contract party against whom you wish to begin proceedings—without this, there is no proceedings, no judgment and no justice. Service of Process in court proceedings is time consuming and can be quite expensive. In Southeast Asia this can be particularly true in disputes involving a defendant who is located outside of the country in question, which then requires a lengthy notification process. In arbitration proceedings, however, it is not necessary to involve any government agency. An arbitration service provider, pursuant to you and your contract party’s arbitration agreement, is able to serve your contract party directly and to commence proceedings through to a worldwide enforceable award even if your contract party does not acknowledge the service or participate in the proceedings. In order for you to submit a dispute to arbitration, it is required that both parties agree to it. 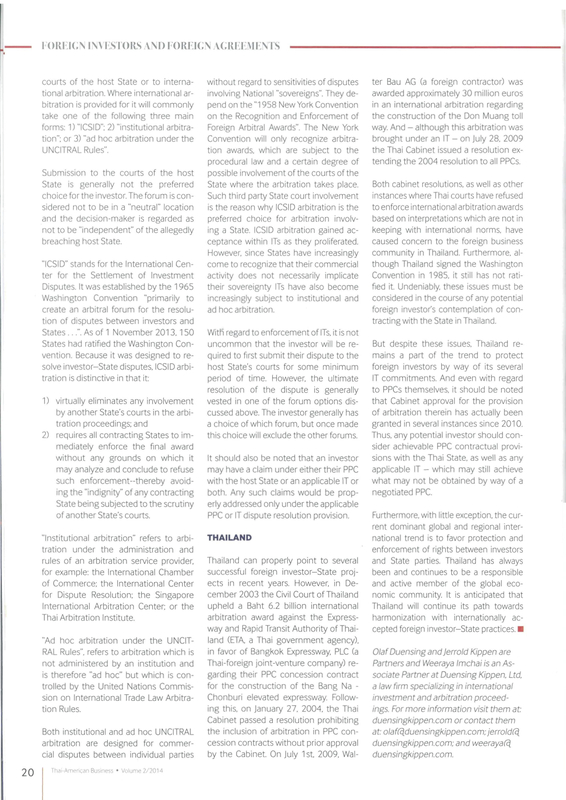 Usually this requires something like what Thailand’s Arbitration Act requires—“an agreement by the parties to submit to arbitration all or certain disputes which have arisen or which may arise between them in respect of a defined legal relationship, whether contractual or not. An arbitration agreement might be in the form of an arbitration clause in a contract or in the form or a separate agreement.” The arbitration agreement needs to be in writing and signed by both parties. Note that it is not possible for one party to unilaterally and without the approval of the other party to submit a dispute to arbitration. If you failed to include an arbitration clause in your agreement and a dispute arises, the dispute must be settled by the local courts unless you both later agree to arbitration proceedings. 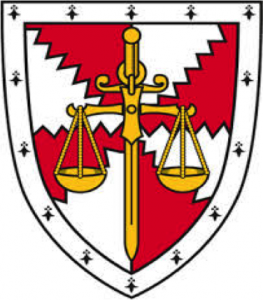 Therefore, it is advisable to include a well-drafted arbitration clause in your agreement, preferably in the initial contract document, before any dispute that requires a third party adjudicator arises. In our experience, once such a dispute arises, getting the parties to agree on anything—including how to resolve the dispute—can be very difficult, if not impossible. 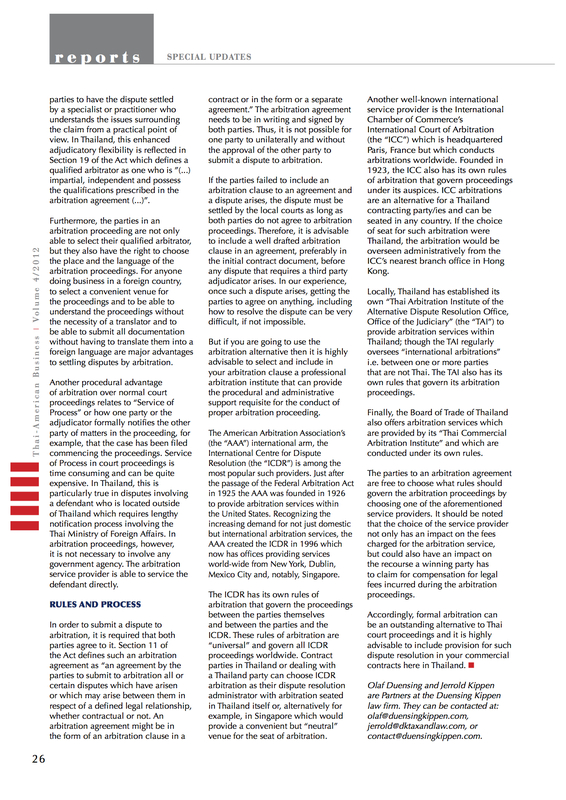 Formal arbitration is often an outstanding alternative to domestic court proceedings. And for international parties it is almost always highly advisable to include such as your dispute resolution mechanism—particularly in Southeast Asia. However, there are a multitude of factors to consider and apply prior to and in the course of selecting and using arbitration to resolve any potential or actual dispute with your contract party. Before doing so, consult a competent arbitration specialist. 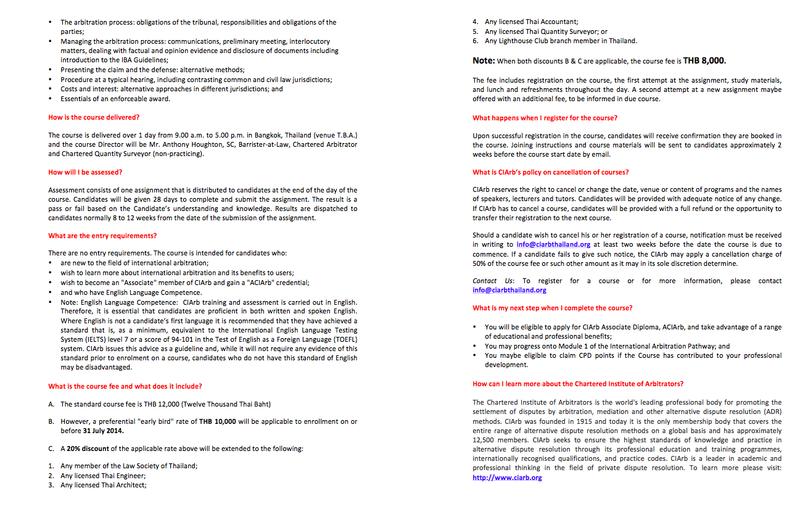 -Part one: international treaties. The pre-eminent international treaty regarding international arbitration is the “New York Convention”. Signatories to the New York Convention will generally recognize any “foreign” arbitration agreement and any foreign arbitration award if that award was made in a country that is also a signatory to the New York Convention. There are currently 144 signatories to the New York Convention. The second reason is because many countries adopt, in large part if not in whole, the United Nations’ Model Arbitration Law when drafting and enacting their own arbitration law. COUNTRY NY CONVENTION? ARBITRATION LAW? FOLLOWS U.N. MODEL LAW? * in March 2012 Myanmar began the legal process of acceding to the New York Convention and of adopting the United Nations Model Law for international (not domestic) arbitrations. # on 16 April 2014 Myanmar formally acceded to the New York Convention. 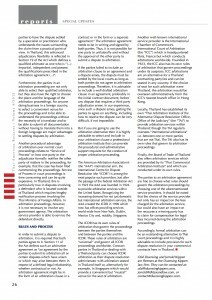 √ in the Spring of 2014, the Myanmar Parliament published a draft Arbitration Bill, which largely follows the UNCITRAL Model law. 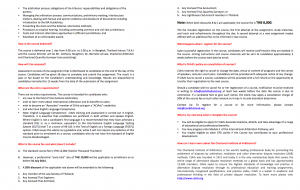 -Part three: the parties’ arbitration agreement. A fundamental difference between litigation in a domestic court and arbitration is the source of the power to decide the dispute. In the former, it is the relevant country’s law. In the latter, it is the private agreement between the parties. It is true that international treaties and national laws are part of the system of law that prescribes arbitration; but it is the private agreement of the parties to submit their dispute to arbitration, which gives the arbitrator the power to decide their dispute. And, in general, the international treaties and national laws merely recognize, support and enforce the parties’ agreement. But typically, arbitration agreements do not contain enough details to manage the arbitration proceedings. Furthermore, an efficient arbitration proceeding requires administrative support. Thus, most arbitration agreements provide that the proceedings will “under the auspicious of” a given arbitration administrative service provider and will follow that service providers’ arbitration procedural rules. By way of such reference the parties thereby incorporate those—generally tried and tested—rules into their agreement without having to draft and agree all such details in advance themselves. -The American Arbitration Association’s international arm, the International Centre for Dispute Resolution, is among the most popular such providers, which now has offices providing services world-wide from New York, Dublin, Mexico City and, notably, Singapore. They are available to conduct arbitrations anywhere in the world and generally the office closest to where the arbitration proceedings are being conducted would then do so. -Another well-known and perhaps the oldest international service provider is the International Chamber of Commerce’s International Court of Arbitration, which is headquartered Paris, France but which also conducts arbitrations worldwide. -The Singapore International Arbitration Center is probably the fastest growing now considered one of the top arbitration administration service providers in the world. 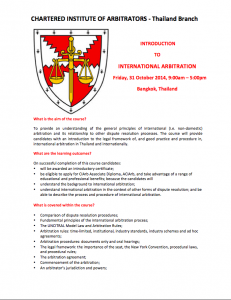 -In Thailand the Thai Arbitration Institute of the Alternative Dispute Resolution Office, Office of the Judiciary, provides arbitration services to proceedings held within Thailand. -Hong Kong and Malaysia also have excellent and well-experienced arbitration service provider centers. Alternatively, it is possible to administer your own proceedings. But if you do not want to draft your own procedural rules, there is a set of rules that was specifically designed by the United Nations for and which are commonly used in such “ad hoc” arbitration proceedings. 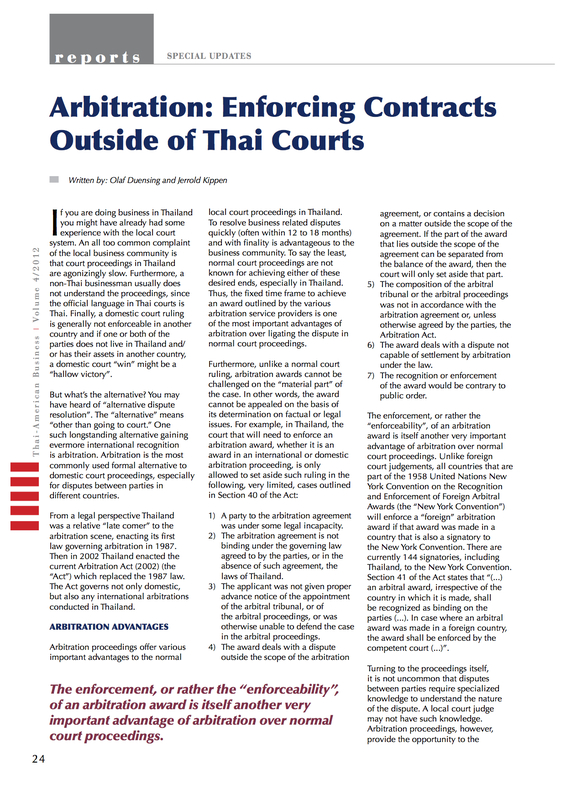 If you have entered any contracts in any of the the Southeast Asia “ASEAN” countries, you might have already had some less than pleasant experience with the local court systems. An all too common complaint is that the court proceedings are often agonizingly slow. Furthermore, if you are not from the country in question it is unlikely that you will be able to understand the proceedings, since the language used in court is generally the official language of that country. What’s more, a domestic court ruling is generally not enforceable in another country. If you or your contract partner does not live in the country where the court is located and/or your contract partner’s assets are located in another country, your domestic court “win” might be a “hollow victory”. But what’s the alternative? You may have heard of “alternative dispute resolution”. The “alternative” means “other than going to court”. One such longstanding alternative gaining evermore international recognition is formal arbitration. Formal arbitration is the most commonly used alternative to domestic court proceedings, especially for disputes between parties from different countries. By “formal” arbitration, we mean arbitration that is prescribed by law. But for the remainder of this three-part article we will also simply call it “arbitration”. 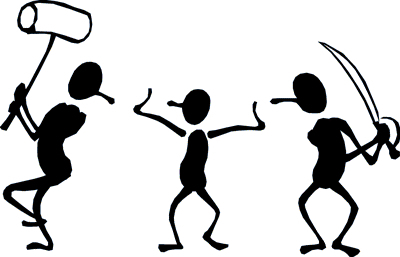 1) A party to the arbitration agreement was under some legal incapacity. 2) The arbitration agreement is not binding under the governing law agreed to by the parties, or in the absence of such agreement, the laws of Thailand. 3) The applicant was not given proper advance notice of the appointment of the arbitral tribunal, or of the arbitral proceedings, or was otherwise unable to defend the case in the arbitral proceedings. 4) The award deals with a dispute outside the scope of the arbitration agreement, or contains a decision on a matter outside the scope of the agreement. If the part of the award that lies outside the scope of the agreement can be separated from the balance of the award, then the court will only set aside that part. 5) The composition of the arbitral tribunal or the arbitral proceedings was not in accordance with the arbitration agreement or, unless otherwise agreed by the parties, the Arbitration ActThe award deals with a dispute not capable of settlement by arbitration under the law. 6) The recognition or enforcement of the award would be contrary to public order. but not if the court believes the arbitrator made a mistake—even an egregious one—about the law applicable to or regarding an essential fact that should have determined the outcome of the proceeding differently. The reason that most countries in the world including those in Southeast Asia limit any challenge to an arbitration award is because they are signatories to an international treaty—the “New York Convention”. Pursuant to the New York Convention, any signatory country (currently 144) will enforce an arbitration award made in any other signatory country—except in essentially the same very limited circumstances outlined above where an arbitration award may be set aside. Thus, arbitration can provide you with a relatively quick judgment, which is immediately enforceable almost anywhere in the world—a huge advantage over domestic court proceedings in ASEAN. But these are only two of the reasons we recommend that you consider including arbitration as your contract’s dispute resolution mechanism. This entry was posted in Uncategorized on March 20, 2014 by duensingkippen.